Core 59 brings the pinnacle of precision, consistency and reliability to your studio. This 3-way Core 59 features intelligently designed, yet simple-to-use DSP, the highest quality Pascal Class-D amplication, digital and analog connectivity, easy mounting options, the best non-fatiguing drivers in the business and so much. Core 59, the flagship of Dynaudio's high-end professional reference monitor series, is that monitor. This three-way speaker features uncompromising class-D amplification, cutting-edge digital signal processing, a super-inert 44mm-thick baffle and a flat bass response down to 42Hz with -6dB at 36Hz. It’s a serious system designed for serious audio professionals. Core 59 has been made for the highest-demand environments that recording engineers, mixers, producers, and editors work in and has been specifically designed to solve many of the monitoring issues that career professionals face every day. Listener fatigue is the thorn in the side of every studio engineer. Once it sets in, you’re done for the day. Core 59’s all-new Esotar Pro tweeter has been created to keep fatigue at bay so you won’t be finished before the mix is. Dynaudio have long been known for their sweet-sounding soft-dome tweeters. They provide hours of pinpoint imaging and detail without the tiring quality that’s common to other designs. The Esotar Pro builds on this heritage with the ingenious Hexis device. It’s an inner dome that sits just behind the diaphragm and optimises airflow, smooths the frequency response and eliminates unwanted internal resonances. The result is outstanding imaging, transient detail, and effortless high frequency response. The speaker’s 5in midrange driver provides staggering detail. It uses our proprietary MSP (Magnesium Silicate Polymer) material in its cone for the best combination of lightness, stiffness and damping and, coupled with an aluminium voice-coil, has an incredibly fast response and authoritative control from its neodymium magnet system. With crossover points at 312Hz and 5.1kHz, Core 59 delivers so much more of the critical vocal range in one driver than typical designs, ensuring your mix decisions on vocal balances and dialogue subtleties are made with total confidence. Core 59’s new bass driver has emerged from over 18 months of intensive study into subwoofer driver technology, including our 18S subwoofer which dives all the way down to 16Hz. The outcome of that research is a new copper voice-coil and glass- fibre former, pushed by ceramic magnets and a 500W class-D Pascal amplifier. It gives the 9 1/2in long-excursion woofer even more grip on the bottom without sacrificing a deep frequency response. Because each driver is handmade in our factory in Denmark (we produce 1.4 million drivers each year for our home hi-fi, custom-install, in-car and pro-studio speakers), we can maintain incredible consistency. That means you can use Core monitors in multiple studios and have them all sound and perform at the same high level – everything you need to hear, everywhere you go. Should you need to replace a driver, the system will even auto-calibrate itself to the new unit for a seamless transition. Core 59’s Orbit baffle rotates, so you can use it in left, right, or centre-channel orientation. You can even position the woofer above the tweeter/midrange assembly to accommodate placement in front of a console in an LCR array. Since every application is unique and monitors may need to be placed in a variety of environments – on their sides, vertically or sometimes even inverted – the Core 59 has indentations on all four sides- so all you need to do is attach special Dynaudio pads to protect the cabinet’s finish and stabilise it on the mounting surface. Core 59 is also compatible with standard VESA mounting brackets should you want to mount them on walls or the ceiling as part of a multichannel or immersive-audio reference system such as Dolby ATMOS. Positioning is critical when installing a monitor system. That’s why each Core 59 has two DSP filters to address its position and boundary locations. For example, if you place the monitors on the meter bridge of a large-format mixing console, set them to ‘Desk’. This will help compensate for the sound transmitted through the console’s structure and the first reflection created by the mixing surface. On the other hand, if you put the monitors into a purpose-built wall, setting the Position 1 filter to ‘Soffit’ will compensate for the increased bass response. Boundary effects created by placing a monitor close to walls or a ceiling can be compensated for by adjusting the Position 2 filter between ‘Wall’ or ‘Corner’. These filters help compensate for the reflections created by the boundary walls, especially in the lower frequencies. There’s also a low-frequency cutoff at 80 Hz that can be engaged if you’re using Core 59 with a subwoofer to extend the low frequency response. Instead of simply fine-tuning the tweeter level up or down, which will affect phase response, Core 59 uses a full-spectrum band-pass filter that tilts depending on the desired tonal response. In the ‘Dark’ setting, the entire frequency response is tilted so that 20kHz is down -1.5dB, while 20Hz is up +1.5dB. In ‘Bright’, the tilt is reversed (+1.5dB at 20kHz and -1.5dB at 20Hz). This gentle filter maintains the proper phase response between the drivers while providing the tone that meet your tastes. The changes are subtle, but often this little tweak is enough to make the sound balance just right. 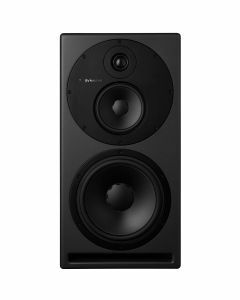 Dynaudio have provided a range of 0dB to +24dB to match the analogue input sensitivity to the output level. Once optimised, Core 59 processes all analogue signals at a 192kHz sampling rate for the greatest degree of mathematical precision from the advanced DSP. When using the AES digital inputs, first you must determine which channel (left or right) of the AES stream is used for that monitor, and a second to determine the maximum output SPL. If you want maximum output SPL, set this to 112dB. If you work mostly at lower levels, choose a lower SPL setting to optimize the bit resolution of the AES input for the best linearity. When using the AES input, Core 59’s DSP operates at the incoming sample rate and either locks to the AES clock or incoming word clock to maintain the most accurate signal possible. Simple to use... but incredibly powerful.